For almost 4 years the western front had been mostly static, but all of that was about to change. For almost 4 years both sides had been throwing themselves at the other without much success, but with Operation Michael the Germans would finally change the map in a drastic way. To do this they had gathered over 6500 artillery pieces and over 3000 minenwerfers. They had also assembled a massive superiority in men and in the air. This would be the great moment, the beginning of the Kaiserschlacht, hopefully the beginning of the end of the war. The only question would be, would it be successful, and if it was, how much would the Germans gain. In the darkness before the infantry assault began final orders were issued all along the front. On the British side they prepared for the coming attack, here is Private f. Plumer of the 24th Machine gun Battalion "We set about getting as much ammunition as handy as possible, filling all our spare belts, getting extra cans of water for cooling the machine-guns, putting up bits of camouflage and, generally speaking, getting ready. Personally I wondered what it would be like. I think I imagined that the Germans would stumble unwittingly up to our guns and that we would shoot them all down and then resume our previous pattern of life. I felt that nothing would hit me; I felt I was fireproof." On the German side men prepared to move forward, like Leutenant Reinhold Spengler of the 1st Bavarian Division, who was in high spirits, "This display of military power made us hope that the long depressing years of war would soon come to a switft and victorious end. Perhaps now we would have the upper hand!" All along the front German pioneer units had crawled out in between the lines, their goal was to make sure that the wire was cut so that the assault troops could quickly pass through. Gefreiter Paul Kretschmer was among these men "Then we reached the barbed wire, our objective. But there is nothing for us to do. The wire is completely destroyed. There wasn’t really any trench left, just craters and craters. Now I looked back the way we had come and saw the swarm of men following. I couldn’t stop a lump coming to my throat. Only a few of the enemy had survived the storm; some were wounded. They stood with hands up. There was no need to tell them; they got the message – ‘to the rear’." As the first assault troops moved through, many would encounter almost no resistance in the first trenches, Fuselier Waldemar Schmielau of the 5th Guard Grenadier Regiment discusses his experience in the first few ways of German troops "I saw my first Englishman – dead, headless, in the British trench. In my mind I saw a map of England and Ireland and I thought that somewhere there there would be sadness. We had not been fired upon at all and our first realisation that we had reached the British front line was the sight of this dead man. We could hardly realise that this had once been a trench; it was difficult to see the line of it, it had been so heavily shelled by our artillery. That dead English soldier was the only Englishman I saw all day, dead or alive. We found a tin of sea biscuits there, very hard and yet most welcome. Then it was time for us to get on again." This was not atypical, many German troops would not see any British soldiers for hours and those that did usually did not find them in any mood to fight. Here is Lieutenant W.D. Scott of the 6th Somerset Light Infantry who would be one of the British soldiers near the front when the attack began "It was very foggy and I heard no firing at all. If I had been more experienced, I would have known what was happening but the first I knew that the Germans had attacked at all was when I went round the traverse of our trench and walked into this horrible little German with thick glasses on. It was the first German I had ever seen. He put his bayonet at the centre of my stomach and said, ‘Kamerad, yes or no?’ I said, ‘Yes’." As they progressed forward the German troops were still cloaked in a heavy fog, which caused many units to get lost, but it also made it difficult for the British to coordinate their defenses. There were units that did manage to mount some resistance, but they were usually not very successful. Gunner Walter Lugg would be behind the front, but would soon find himself near the front lines and preparing to leave "The chaps who weren't handling the guns lay out with rifles to hold off the Jerries when we stopped firing. I was handling one of the guns, so I had to help to get the breech-block out, take the No. 7 sights aay. Most of us managed to get back all night, creeping away in ones and twos." Behind the front officers were slow to begin to react, but Private Alex Jameison of the 9th Division would be part of some reinforcements pushed forward in the early hours of the attack to try and stem the tide, he would not find much to work with in terms of defenses "We were right out in the open, and we were told to lie down on some slightly raised ground and to make some sort of protection by digging in with our entrenching tools. Well, an entrenching tool is completely useless piece of equipment unless it was meant to protect the base of your spine when it was hanging from your belt, but it only added to the weight we had to carry when we were on the move. The small pile of earth I managed to throw up was absolutely laughable." While the front line positions were falling the German assault troops continued to push forward. They would next run into the main positions of the Forward Zone. 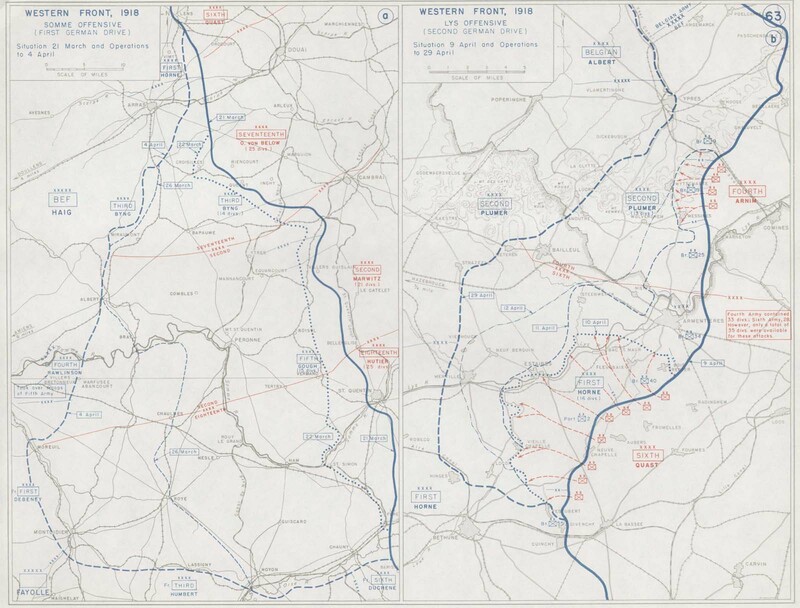 These positions were much more heavily manned and armed when compared with the front lines, they were designed with the purpose of slowing down any German attack. There were good solid positions with heavy machine guns, trench mortars, and even some 18-pounder field guns designed to work as anti-tank guns. Here the fog once again helped the Germans, even if it did cause some disorganization in their units. They handled this disorganization gracefully and when units collided their leaders would get together, determine roughly where they were, then move off in oppsoite directions. The designed flexibility of the German tactics became a real asset in this kind of environments since indidivdual units were expecting and trained to work alone without clear information about the situation around them. Overall they kept moving forward. It is probably important to say at this point that while I am describing the events of March 21st it needs to be said that while we can tell a pretty coherent story about what was happening on the ground on March 21st events were anything but coherent. Officers and men, even those close to the front, had no idea what was happening. There was little ability to communicate what was happening on the left or right and getting good solid information from the front or rear was almost impossible. This meant that most of the fighting was small desperate actions by small units with no clear picture of the wider events. As the German assault troops pushed forward they were running into stronger positions, and in some cases barbed wire that was still intact. What they found in front was a series of redoubts, and they tried to push between them. This would allow the attack to continue while follow on units would deal with the British redoubts. These strong British positions would have worked well against more traditional offensives, but since the Germans were planning to push past strong points anyway it played right into their hands. By concentrating the defense is nice small compact areas the British allowed themselves to be easily cut off. Sure, some of the defenses of the redoubts would last for the entire day, but by that point they were fighting German units who were not even supposed to be trying to push forward. Here is Private G.H. Leedham of the 1st Leicesters "To tell you the truth, I didn’t want to die but I thought we were going to. I didn’t think we were going to see the sunset but I remember thinking that, whatever they did to us, we had at least earned our bob that day. Mind you, we had no fancy ideas about fighting to the last man." And here is Private J. Parkinson of the 16th Machine Gun Battalion "We were in action for some time and I think we hit many. Germans. Then it went quiet and I thought that we had stopped them. I was loading another belt into the gun when I felt a bump in the back. I turned round and there was a German officer with a revolver in my back. ‘Come along, Tommy. You’ve done enough.’ I turned round then and said, ‘Thank you very much, sir.’ I know what I would have done if I had been held up by a machine-gunner and had that revolver in my hand. I’d have finished him off. He must have been a real gentleman. It was twenty minutes past ten; I know to the minute because I looked at my watch." As the German battle units moved up and began really trying to take the redoubts they often found them strongly held and they were forced to wait for heavier weapons to be brought up before making their final assaults. Inside the redoubts eacch officer in charge had to make decisions about when and if to reatreat. There were officers at the front who could have ordered the retreats, but they were supposed to wait for orders from their brigade commander before ordering such a movement. In many cases these brigade commanders never even really knew what was happening Here is captain H.H. Davies a Brigade Intelligence Officer explaining the confusion "The battalions normally sent in situation reports before breakfast but we had heard nothing that morning. We stood around Brigade H.Q. in a sunken road; it was foggy and noisy and we had no idea what was happening. We had a little conference and the brigadier decided that someone ought to go up to the front, see what was happening, and report back. I, as Intelligence Officer, was chosen to go. I and my groom set off on horseback. I don’t know how we ever got there. I had a wonderful horse and he cleared barbed wire and empty trenches – he was taking me, I wasn’t taking him. We never saw a soul." By the time Brigade commanders found out what was happening retreat was often already impossible because the surviving forward positions were already surrounded. the retreats that did happen were often due to small units just decided that hey had put up enough of a fight. These units often put up heavy resistance before deciding to retire, and by that point the only available options were often either surrender or die. It would take the Germans another hour and a half for most of the positions of the Forward Zone to fall ot their attacks, and by mid-day there were only a few redoubts still holding out. 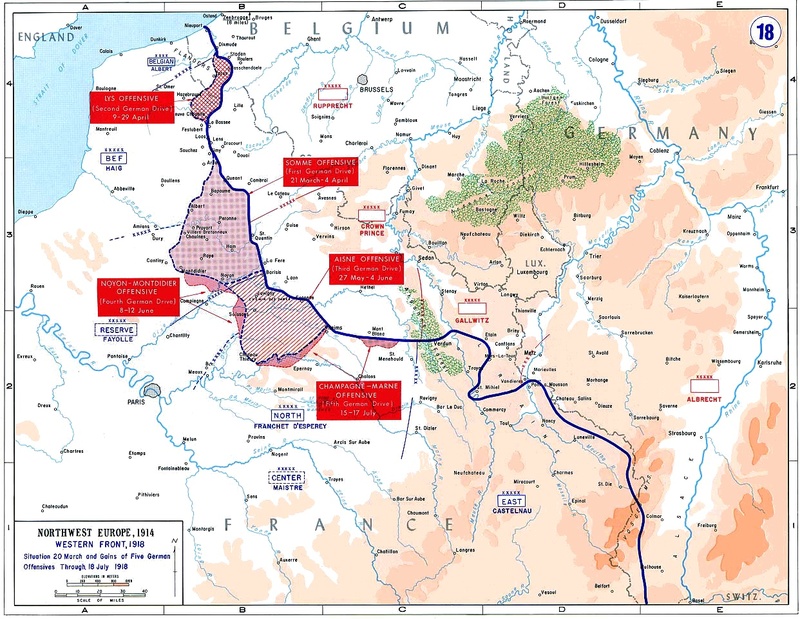 One area that was holding out quite well was the most forward British positions inside the Flesquieres Salient. Th salient was the point in the line that had been created by the Battle of Cambrai near the end of 1917. Instead of attacking this area the Germans had decided early on that they would just bypass it. They would instead focus on attacking to the north and south of the salient and then attempt to encircle it and cut off the troops inside. 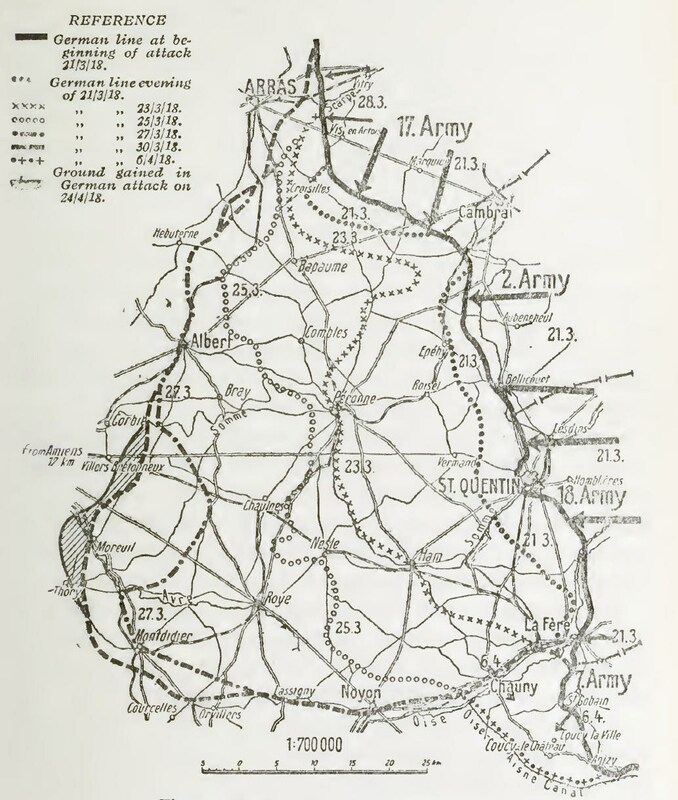 Throughout the entire 11 mile front line of the salient the Germans launched some small attacks and the British troops manning the line thought they did very well. What they could not have known is that the attacks on the salient were just a bluff and the Germans just wanted to make sure the defenders thought they were doing really good and did not instantly start to retreat. At that very moment troops were already beginning to move south from the north side and north from the south side to cut off the salient. If they were able to surround the troops inside the British would have 3 divisions cut off, it would be a disaster on a day of disasters. Throughout the morning Gough and other British officers behind the front found themselves without much information. They knew that something was happening up on the front lines and that the Germans were attacking, but that was about it. While the situation was confusing at the front it was impossible to get any really solid intelligence about what was happening. All that Gough and his staff could do was wait, and put a few plans in place to make sure as many fighting units as possible were ready for action at a moments notice. His staff even finalized plans to make fighting units out of any soldiers in replacement depots and administrative units, which was a good call, they would all be needed. Further back from the front Haig was doing much the same thing that Gough was. It is interesting to think about but as much experience as the British army leadership had in the war by this point, they have very little experience on the defensive. Haig had not commanded a defensive battle since the retreat from Mons in 1914. This put them all in a different situation, and it would be confusion that would not sort itself out for hours as reports, sometimes totally contradicting each other, began to trickle back from the front. For the Germans the officers behind the front just kept pushing troops forward and trusted those that were already sent to keep moving. Behind the forward troops were hundreds of thousands of men who were pushing forward, the entire landscape was one of movement. This would have been a perfect time for the British artillery to drop a barrage on these troops, but they were too busy either displacing to keep ahead of the attack or fighting for their lives. This allowed the masses of Germans infantry that would essential to keep the attack going to move forward unmolested. Here is Unteroffizier Werhner Eberbach of the 126th Regiment with his experience from within this mass of men "The scene was one of movement, not of noise. The whole front was in motion, all going one way. It was a silent march, just the occasional order to stop and lie down or to move on again. We heard no shooting. Where was the British artillery? Our artillery was silent too because they had started to move forward also. Our infantry ahead didn’t seem to be fighting at all either. We didn’t speak much; the exertion was too much for that. We thought that the English had withdrawn and concentrated all their reserves well back. We kept asking where the English were but no one knew. We believed that we had at last broken right through the English front and that the moment we had awaited all through the war had arrived. Now we could finish it off. It was a thrilling moment." 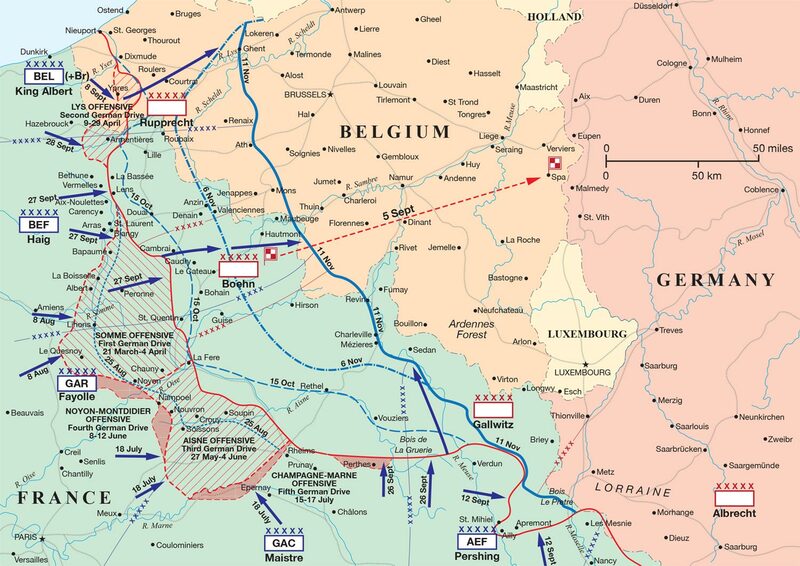 Along the rest of the front the German attack was now coming up on the main battle zone, the first line of which was called the Red Line. They reached these defenses around noon, although there was a huge variance on the specific time. At these positions the Germans would run up against the strongest fortifications they would face in the attack with a strong continuous set of trench lines, barbed wire, heavy machine guns, and good fields of fire. The Battle Zone had been constructed about 4,000 yards behind the forward Zone, which was a lot of ground to cover. There were a good number of infantry positions, machine guns, and artillery positions which could lay down fire on the German advane. Roughly half of the total British infantry were stationed in these defensive positions. To compound all of these problems the Germans were also moving away from their artillery which was even at that moment beginning to move forward to continue to supply the attack. The final problem for the Germans was that the fog that had been so useful to them early in the day was finally starting to burn off which made them more vulnerable to fire. Due to all of these reasons the fight over the Battle Zone would take longer than the previous positions, with the fighting continuing for a good portion of the afternoon along most of the front and into the evening in some. The War Diary of the British 30th Division would say this of the divisions actions in the Battle Zone. Twenty-four machine-guns were posted in the Battle Zone. Teams were provided with deep dug-outs or they fired from shafts … The guns came into action with great effect, breaking attack after attack. The Germans came to a standstill in the evening and the majority broke and ran to the cover of slopes in the rear. A quarry to the north-east of Roupy proved a fatal attraction. At one time, 1,000 men were in and around it. The machine-guns ripped through them with fatal effect, all guns firing at full rate. Two guns here fired 35,000 rounds, another 12,000 and a fourth a little less." While many accounts were negative for the British, not all were, here is Sergeant W. Donoghu of the 478th Field Company "While it was still misty, a German attack was made on our trench, led by an officer with a revolver; he was mounted on a horse and waving his men on. After two years of trench warfare, with rarely a chance of seeing a German, let alone fire at one, this was an opportunity too good to miss. So I took a careful aim and squeezed the trigger and had the satisfaction of seeing him fall from his horse, which then turned back and galloped off into the mist, followed by his men at the double. As my section were also all firing at the same time, I cannot be certain that it was my bullet which brought about the end of the attack. In a curious way, I quite enjoyed the battle. I expect it was because I had not previously been in a position to engage the enemy at close quarters and, at my age, then twenty-two, I was thoroughly enjoying myself, with no thought of the consequences. I think the same could be said of most of my comrades." While the fighting was desperate, the British were soon under pressure all along the front as fresh German divisions continued to pour into the fight. Everywhere was a mass of confusion as some German units began to finally make their way through while small British units mounted some small counterattacks. In other places the British defenders held out for a time, only to then be surrounded due to the successes of the Germans on either side. All along the front the British artillery soon found themselves i n a risky situation, some batteries had already been pulled back, but some were still near the fighting. In many cases they were forced to engage advancing German troops over over sights, something they had not done since the early days of 1914. Here is Sergeant J. Sellars describing the desperate defense of the guns "All available rifles were collected and all ranks ordered to take cover behind the roofs of the gun-pits, signals shelter, etc. The Number Ones of gun crews were instructed to remove the dial sight from abandoned guns. My limber gunner went one better and took off the dial-sight carrier as well. Nobody was going to use my gun with any accuracy. The number of rounds we’d fired made a new calibration necessary anyway. Then we were given instructions to ‘make a run for it’ to a trench line some 100–200 yards behind through a gap in the wire which almost surrounded our position. We were on no account to stop to pick up casualties. This proved to be a wise order but it was heart-breaking to leave several good men hit, mostly in legs and feet, by machine-guns trained on the gap"
By late afternoon, in many areas along the front, the British were forced to retreat. This would not be an organized withdrawal, but a true retreat, maybe not a rout, but at the very least a mildly organized retreat. Even if the British did not like to call it that. Here is Martin MIddlebrook again from The Kaiser's Battle "A study of official British reports, often compiled when officers returned from German prison camps after the war, all too often reveals references to Germans seen coming through on the flank because the neighbouring unit had either surrendered or fallen back without sufficient cause. Personal accounts, written more recently, often echo the same theme, although it is rarely the writer’s own battalion that is blamed for failing to hold; another unit to right or left always gets the blame. The effect of such retreats was that, right from the beginning of this battle, there developed an attitude of uncertainty about flanks, a tendency for men in good defensive positions to be looking over their shoulders and wondering if they too ought not to be moving back." Operation Michael would sometimes be called The March Retreat for a very good reason. While many troops were beginning to pull back, there were still some redoubts holding out in the forward zones. By this point the officers in those redoubts assumed there was very little chance of relief. Theoretically the Battle Zone was supposed to stop the Germans and then they would send relieving forces, but that seemed unlikely to those in the redoubts. Even those officers behind the front realized that something had to be done and so orders began to be given out all along the front for those redoubts still being held to begin to make their way back after dark. Brigade-Major Harold Howitt would describe what it was like communicating with a redoubt in his sector "The last message I received was 'We are surrounded now, Sir, what are we to do?' It was an agonizing position, so I rang the Divisional Commander and, as the whole front had collapsed, I was told to give them permission to cut their way out if they could. It was five o-clock before I was able to get back to them, and after that I heard no more." Many redoubts never received these orders and were often forced to surrender once their ammunication ran out. All along the front thousands of British troops would give themselves up. Captain Davies the Brigade Intelligence Officer would find himself in one of these positions "I went up to the front line then – it was the old German Hindenburg Line – and I spent the next few hours helping to carry wounded and dead down into the palatial dug-outs that the Germans had built. The slaughter had been terrific, all caused by shellfire. By afternoon, the weather was fine; the fog had lifted and we were waiting for something to happen, perhaps the Germans to attack from the front or our own supporting troops to come up from the rear. While we were looking to the rear with our field glasses, watching some troops approaching, thinking it was our supports, we saw to our astonishment that they were Germans, coming quite steadily in the open towards us. Those of our men who could do anything were getting fewer and fewer – we had been under shell-fire all the time – so we collected all the arms we could, mostly Mills bombs, and concentrated ourselves into what we called a strongpoint in those days, so that we could make a last bid for it. We held on for about two hours. The Germans simply surrounded us and outnumbered us and, when all our bombs and ammunition had gone, we could do no more." Other men would be even more surprised, like Corporal Ted Gale of the 14th Division "WE got a brew going but we hadn't been in the dugout for more than about 10 minutes when the Captain popped his head in the dugout door. He said 'You can all come up. You won't want your rifles." He said it quite calm, like. Anyway, we came walking up the dugout steps, and there was all these Jerries round us! of course, we realized what had happened. Jerry had broken through on the right and left of us. This was a mopping up party coming. They'd never attemped a frontal attack. That was the strategy, you see: they went through on the right and left" For the German troops still moving forward, seeing the British prisoners being moved back behind the front was an eye opening sight. Leutenant Reinhold Spengler of the 1st Bavarian Division would see one such party of prisoners "After 500 meters a group of figures wearing flat steel helmets appeared in front of us through the fog. At first we did not know who they were, but soon they proved to be Englsihment. They carried no weapons and had raised their arms in the air as a sign of surrender. Coming closer, I could see by the expressions on their faces that they had experienced a terrifying time during the last hours of our bombardment." In summary, March 21st had been a very bad day for the British, but things were about to get worse.